Wendy Pearl, from DCR’s Office of Cultural Resources, is supervising the Ernestina-Morrissey rehabilitation. She presents progress reports to the Commission at each meeting. 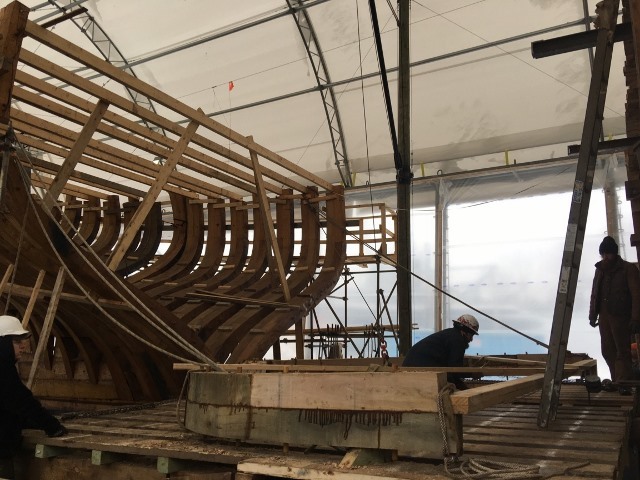 This month they were excited to hear that frames #8-24 ( in the bow) are complete, and the shipyard crew is working to fill in the frames #32-24 amidships. There are just 7 square frames left and the hull framing will be complete! Here just a few frames are left to join the new keel to the foredeck. You can see the grey painted lead ballast scarfed into the wood of the keel. As of January 18 these frames were complete. Looking forward, just a few frames forward are left to raise and the work platform amidships will be removed so the final frames can be raised there. The frames are so big and heavy that the futtocks are assembled into the frames on location. Soon the work surface will be moved so the midships frames can be raised on the keel. This “Phase 1″ work now ongoing will result in a hull that meets all Coast Guard requirements for a ship that will be able to serve the Commonwealth in many capacities, including trans-Atlantic voyages. 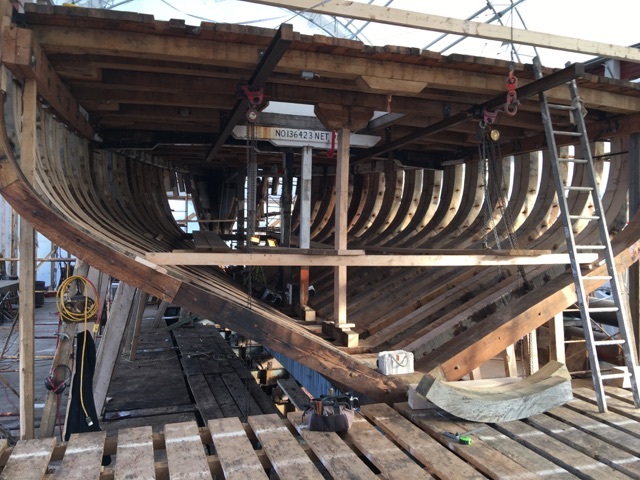 Captain Burnham and the shipyard crew are working closely with the Coast Guard as the work proceeds to ensure that, when complete, Ernestina-Morrissey will be ready to fulfill these expectations. Phase 2 will include fitting out the ship for its future uses. 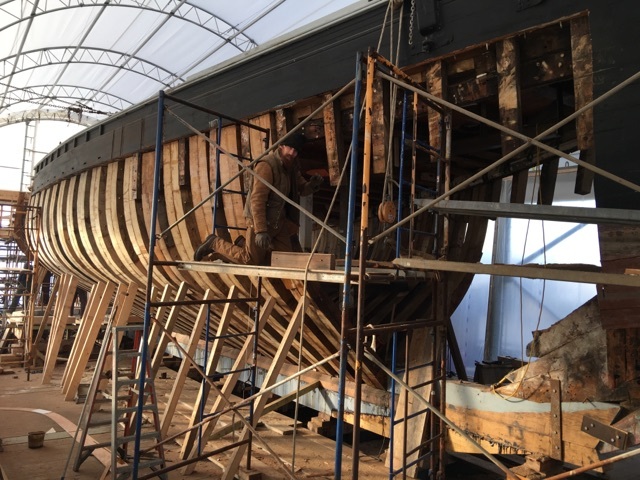 Harold Burnham continues work on the Phase 2 budget and will reach out to Massachusetts Maritime Academy (MMA) and other ship building experts to better refine costs the for fitting out the vessel. A more complete Phase 2 scope is expected by April 2017. Harold Burnham, DCR Owners Representative for the Ernestina-Morrissey project, has been asked to be on a panel for the Tall Ships America Annual Meeting. The theme for the conference is “The Way of a Ship: Linking our History, Heritage and Future.” , with one topic being Historic Ship Preservation and Utilization. 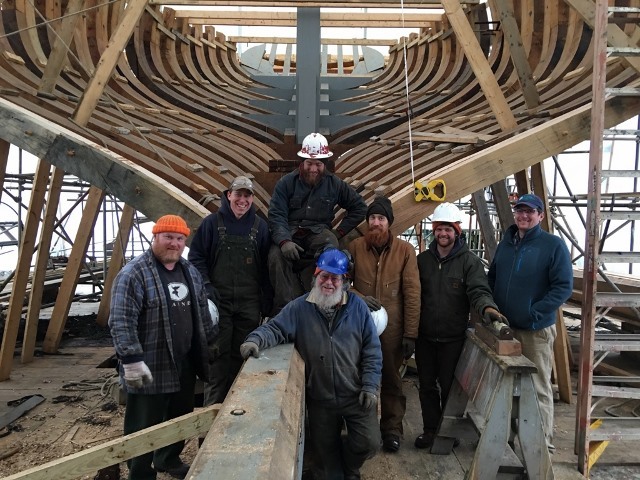 The Maritime Heritage Panel will include representatives from the USS Constitution, the Schooner Adventure, and Harold for the Schooner Ernestina Morrissey. These are all historic ships undergoing rehabilitation. Good company for Ernestina-Morrissey! This entry was posted in Maintenance, Maintenance and Operations Committee. Bookmark the permalink.